Disc Problems – Can Lay YOU on your back! 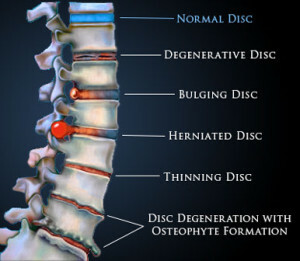 Discs are simply the spacers between your spine. They act as shock absorbers. Have you ever ridden in or seen a car with bad shocks? It is extremely uncomfortable as you go over bumps. This is similarly the problem when discs are not working properly, your spine crashes together. There are different types of damage that can occur to the discs. Herniation or slipped disc is when the disc protrudes which can cause a lot of pain or discomfort.Degeneration is when a disc that is literally wasting away; dying. This can cause pain in the area of the damage. It can also cause pain to shoot down the arms and hands similarly, it can cause the pain to travel down the legs and possibly into the feet. Disc injuries can also cause numbness or tingling. Disc injuries can also cause numbness or tingling, which can be even worse than pain, as you are now losing the ability to feel. No one can get a “replacement” spine. You only get one. Do You Have Disc Problems? If you are having trouble with your discs, or you suspect that you may have disc problems, your only 2 options are a Chiropractor or a major surgery (which may or may not work). Do not let them cut you! Before you arrange to have yourself put under a knife, check out the non invasive option of Chiropractic. No drugs, no surgery, no recovery time, no permanent scarring and tissue damage. Try Chiropractic! We will take care of YOU, using the latest safest and most gentle Chiropractic techniques available today. Chiropractic is the SAFE and Natural approach to healthcare. Better health can lead to not only more years in your life, but more life in those years! We understand that your time is valuable and that it is difficult to balance work, family, errands, etc. It is those very factors why it is necessary to carve out an hour to take care of yourself for a consultation and exam before the condition worsens. Remember, there are many people depending on you being at your best. If you can’t do it for yourself, do it for them! Pain and other symptoms are your body letting you know that SOMETHING IS NOT RIGHT and you better do something about it BEFORE IT GETS WORSE. Come in for the introductory offer and see what other options are out there- other than drugging yourself with pain killers (that only mask the problem). Do not let the concern of cost deter you from finding out if Chiropractic can help you with your condition. Put yourself first. Find out if you are a good candidate for Chiropractic by coming in on the special being offered to new patients. If you decide you would like to proceed and become a patient, know that we are willing to work with committed people, to help them gain back their health. Maybe you have only been to a Chiropractor a few times, or perhaps never at all. You may be used to seeing another type of doctor for your symptoms and health concerns. Know that you may come in for an introductory offer, to see if this is something you would like to pursue. Of course, no treatment of any kind would be done without your consent and the doctor accepting you as a patient first. A Doctor of Chiropractic is the least invasive and most conservative type of doctor available. Check out this very effective, yet gentle option first. You owe it to yourself and those that count on you. Is This The Right Place For Disc Problems? Disc problems are truly a “pain in the neck”. Or for you, it may be a pain in your back. Wherever your pain or trouble is, it definitely requires attention before it worsens and spreads. Have you ever met anyone who has said they have had a successful back or neck surgery? Have you ever known anyone that has had back or neck surgery? Did they seem to have a better quality of life afterwards? Did they have greater range of motion afterwards? Less physical complaints? We haven’t met these people either. Don’t allow yourself to join this group. See if a Chiropractor can help you before you reach for drugs or schedule a surgery. Schedule Your Consultation, Call Now!